The Summit, hosted by Bank On, was the first event open to the public to increase awareness of un- and underbanked related issues and to initiate collective conversations and efforts to advance financial inclusion in our community. 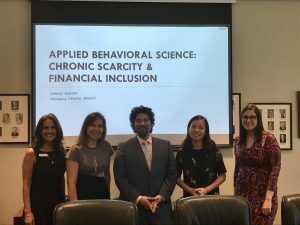 The keynote speaker Anthony Barrows, Managing Director at Ideas42 based in NYC, shared Ideas42’s findings on behavioral economics and the decision-making of individuals living in poverty and the scarcity mindset. To read more about the event in the Sarasota Herald Tribune, click here.